GoSpeed Racer, best known for being the owner of KONA Radio, the DJ for many of Bay City's events, and a display name matching the name of a Japanese cartoon character, was recently crowned Miss Bay City near the end of it's "Hot Bay City Nights" yearly summer car show. GoSpeed had been Djing the Miss Bay City Contest for the past few years and had entered once before. “I figured I'd give it a shot this year,” she explained. GoSpeed does have a "Mark-Five," the car her cartoon counterpart drives, which was in the Newser for a cartoon in 2011. 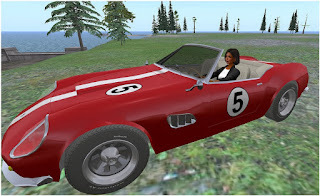 When I asked her if she had ever raced with it, she said, “No, it's a very fast vehicle and that often leads to crashes and horrible sim crossing snafus.” She won a nice sports car from 2Zm as a prize for winning the Miss Bay City Contest. That it had a "5" painted on it, GoSpeed smiled, calling it "Pure coincidence." When I asked if there are any other peaks to winning the Miss Bay City Contest beside the title and bragging rights, she answered, “Nope, nothing else!” There are no specific events she has to attend, or/and responsibilities of the title, but GoSpeed intend to attend as many Bay City events as possible. Of the crown, she says she will wear it mainly at these events. GoSpeed has been attending events in Bay City since 2009. GoSpeed is also a budding novelist, who has completed the drafts to two novels She is working on a third. When asked what they were about, she explained, "They are novels about a futuristic simulation where SL avatars are reconstituted as living AI. Our social media presence is preserved and then used with computer algorithms to synthesize personalities." That is, their personalities are based on how their users used the avatars in actions and virtual speech, and, "on how the algorithm interprets the imagery, blogs, etc... You may have read an article where researchers say that based on a person's lifelong Facebook and other social media postings that an somewhat accurate represntation of their personality can be emulated. So, our avatars live on, but they won't totally be us. I hope to self publish by the new year." You can go to her personal Second Life blog at https://gospeedracer.wordpress.com/ to read more about her stories and other things about her. The link to GoSpeed's blog as well as her other media sites is: http://about.me/GoSpeed_Racer . Pictures from Bixyl Shuftan and GoSpeed Racer. (Download) $12,234 in 2 months GAMBLING App? I dont care about sports. Shame on me but I don't even know the soccer rules. I think I finally found it. Grab It NOW!